carries an assortment of machine-washable Semilla snack bags: pink girly robots, blue robots, yellow and green guitars, pink and yellow flowers. 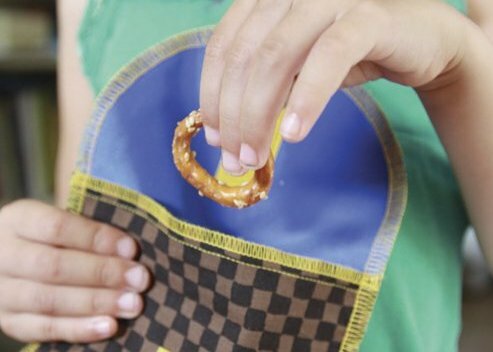 The Chiquita Snack Bag, a small bag with Velcro across the inside top, runs $5.75. A matching two-pack — two different sizes — runs $12.95. A larger-sized wrap that opens up to a placemat costs $7.69. I may have to check these out – last year I bought my daughter these cool three-compartment plastic containers for a sandwich and two snacks, but they’re a bit bulky for her new lunchbox…I figured that at $8 each they saved about $12 worth of plastic baggies over the course of the year, not quite break-even but when we’re talking about less than $10 and considering the amount of trash avoided it’s pretty much negligible. Yes. Yes. And if you bring your own Hello Kitty bento box to a restaurant, then you won’t need to ask for a (styrofoam) doggy bag for leftovers. My daughter, who eats PB&J everyday at school, hates sandwiches that get smashed in her backpack. We have been using a couple of washable sandwich containers for three years. Newer Article: Sunset Cliffs Rescue Operation – Was Victim Pushed or Did He Fall?